If beautiful, orphaned Emily St Aubert is to resist the predatory demands of her new guardian, the inscrutable Signor Montoni, then she must quell the superstitious imaginings that pervade her mind. Within the sombre walls of Montoni’s medieval castle the boundaries of real and imagined terrors are blurred as Emily is drawn into a Gothic web of mystery and intrigue which threaten her not only with the loss of inheritance but also identity. 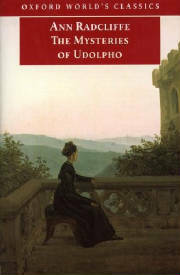 The Mysteries of Udolpho became an instant best-seller and the prototype of Gothic romance.